When news broke of Demi Lovato’s public hospitalization due to unconfirmed reports of a heroin overdose, a public outcry from every day addicts asking where the compassion and understanding was for their own struggles was heard in comment forums across the Internet. Celebrity deaths were compared. Victims were named and blamed for their own “selfish” actions and profane memes captioned to ridicule a young woman in pain. Instead of it being a random junkie on the street, a beautiful celebrity is receiving all of the support every struggling addict wished they could hear from their loved ones. Most families are unable to speak about their own loved ones addiction issues for fear of rejection and misunderstanding from a scared public who want to place blame on the user. 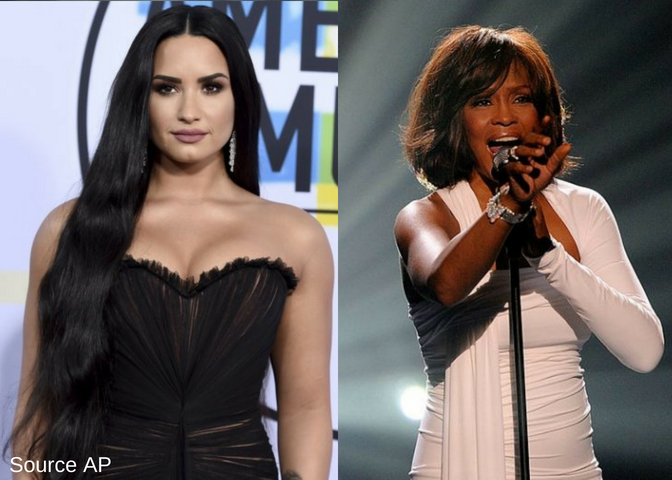 Whitney Houston’s death in 2012 was brought up on news sites, saying if Demi’s skin were a different color, her overdose would be met with a much different reaction. But their honesty about their struggles with addiction where dealt with very differently. Whitney Houston had struggled with addiction for decades, before Lovato was even born. In the 80’s cocaine use was rampant, celebrities were partying together and their lifestyles were bigger than their hair. Addiction wasn’t talked about, HIV was a forced conversation that no one wanted to have, but education was crucial to ending a near fatal outbreak to a fear-mongered public. It wasn’t until 2002 when Houston had dealt with the accusations of drug abuse publicly on a Primetime interview with Diane Sawyer. She admitted to using marijuana, cocaine, alcohol and prescription drugs but emphatically denied her addictions to crack. She told the reporter “Crack is cheap. I make too much for me to ever smoke crack,” she says. “Let’s get that straight, OK? I don’t do crack. I don’t do that. Crack is whack.” In 2011, she entered treatment for her drug addictions. The difference between these two women’s addiction issues is how they chose to handle their existence, and it’s not entirely their fault. Whitney Houston’s drug issues were exposed after the war on drugs came about during the Clinton era, where children were taught to fear marijuana as a gateway drug and the ideology that drug use turned the user into a hot skillet capable of cooking an egg on contact. It was shameful and embarrassing thing to admit publicly to substance abuse and it was seen as a selfish choice instead of a brain disease. Today, a conversation has opened up to the advantage of addicts looking to come clean. Scientific research has show chemical connection between addiction and mental health, and while more and more public opinions agree that addiction is not a choice, stigmas exist regardless. Demi Lovato has braved the judgments and decided to come forward about her struggles, making her a beacon of hope for many people looking for someone to relate too. Demi has shared her struggles with cocaine and prescription pill addiction, as well as her mental health troubles that included her bi-polar diagnosis and eating disorder. She took time away from the spotlight to seek treatment and even did something no other celebrity would think of doing while building their fortune, settling into a sober living home for an entire year after leaving rehab. Since becoming sober Lovato became an advocate for women’s issues, speaking out against body shaming, drug addiction and bulimia. She became a real woman of the people, and spoke candidly about common issues that face men and women everyday. Her sobriety inspired millions, something that undoubtedly carried a heavy weight on her shoulders as a woman struggling on her own to keep away from her own demons. Last month the singer released a song hinting towards her internal conflicts and it was reported by the tabloids that she might have even relapsed after celebrating her 6th year of sobriety. When it was announced that Lovato was revived by a shot of Naloxone rumors flew that the 25 year old was using heroin, but the anti-opioid medication is used for all kinds of overdoses involving opiates, not just heroin. These reports have gone unconfirmed and fiercely denied by those close to her. This is not to discredit the difficulties met by everyday people who also fight off their demons, but what Demi has done has made an overwhelmingly common mental health issue into a conversation that isn’t behind a closed door. Demi Lovato may have had a more welcoming experience compared to other celebrity addicts; she is meeting the same stigma that has been met by others before her. What makes her exposure different is that she has been honest and open from the beginning of her young life. And while everyone loves to watch a celebrity fall, it should be an elemental quality to watch a person rise from the ashes. From everyone here at The Recover, we wish Demi a speedy recovery and an understanding ear. You can overcome your demons and set an example to the millions of struggling addicts who have been longing for a voice to speak for them. And if that being a voice for others becomes too much of a burden, allow yourself the patience to take time to impress yourself, rebuild your strength and fight again. If there’s one thing everyone loves, it’s a comeback story, and Demi is due for a glorifying reappearance at the top.